For a few short weeks each spring, visitors to Landsford Canal State Park in Catawba, South Carolina are surrounded by rare Rocky Shoals spider lilies (Hymenocallis coronaria). 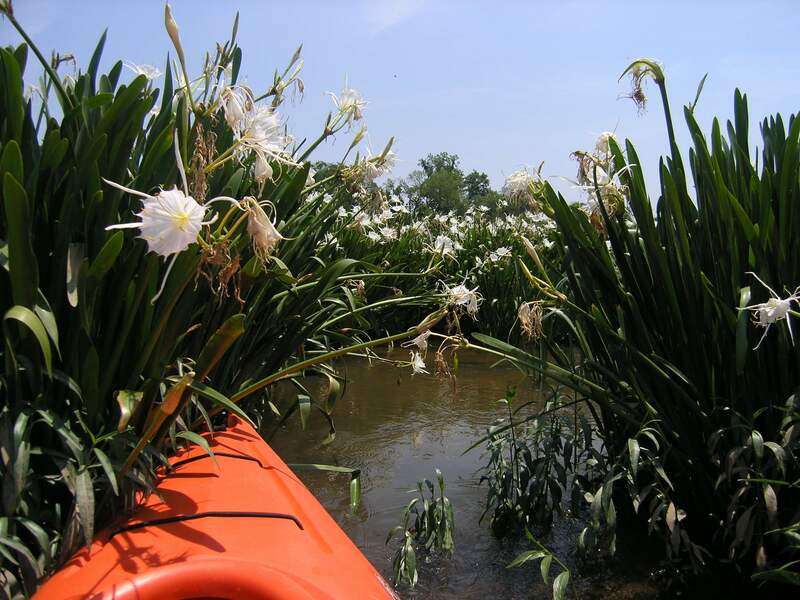 Though visitors usually venture to the park for its spectacular beauty of the Catawba River and incredible canoeing and kayaking along the waterway, these lilies are a rare treat to encounter each year. This fragrant lily is only found in select Southern states – South Carolina, Georgia, Alabama and perhaps North Carolina – and requires plenty of direct sunlight and a very swift but shallow watery surface upon which to grow. Blooming season is generally the months of May and June. 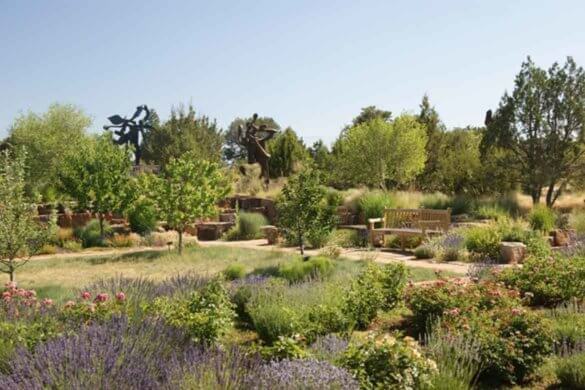 The park has a bloom calendar for the lilies and even a Lilyfest (mid-May) each year. It’s largely believed that Landsford Canal State Park is home to the largest collection of this lily species, but sites along the Cahaba River in Alabama and the Flint River in Georgia would likely contest that claim. Regardless of which state has the largest collection, there’s no argument that this is one of nature’s greatest shows along the East Coast at this time of year. Exposed bedrock and an impressive elevation change have created a set of rapids – or shoals – on the river, and it’s extraordinary that anything can grow in this harsh environment. 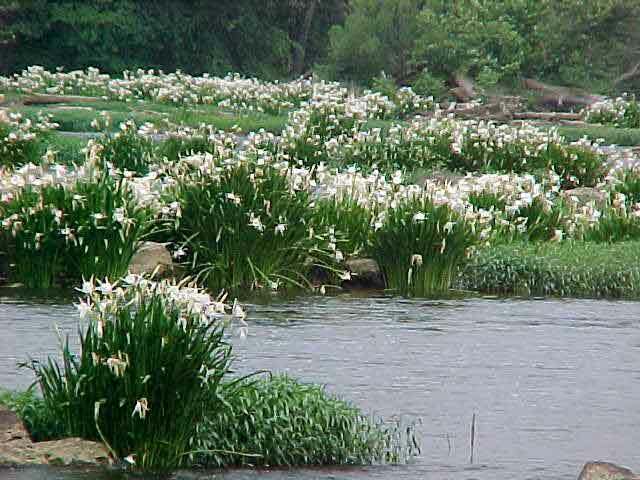 Each lily blooms overnight and only lasts for a single day, but there are enough plants in the Catawba River that right now it appears as if someone has tossed a lace blanket across the water. The very best viewing is from a canoe or kayak, and visitors can bring their own vessel or participate in a tour offered by local outfitters. Those who prefer a softer adventure can take a 1.5-mile round-trip hike along the Canal Trail to an overlook that affords a prime land-based view of the lilies. In addition to the water lilies – which are a guarantee at this time of year – there’s also a chance of spotting the park’s resident nesting pair of bald eagles, which are generally in the area from late February through early June. Lily viewing is available from daylight until dark. Admission is charged to the park. 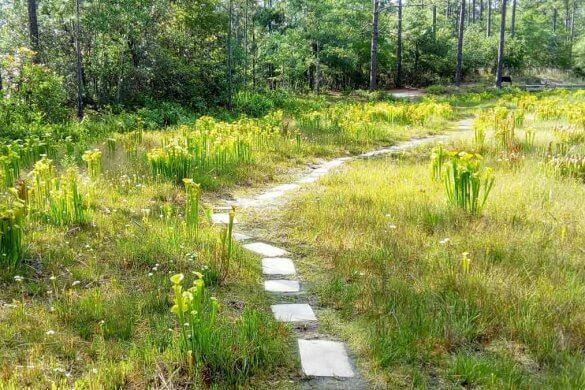 The South Carolina State Park Passport (fee charged) allows free admission to the state’s parks plus a host of other amenities, including free admission to see the lilies. For more information about this fascinating part of South Carolina, contact the Olde English District tourism office.